Product Line: Men-at-Arms - 1800 - 1900 A.D. In 1823 Texas was opened to American settlement; over the next 12 years thousands took advantage of the opportunity. During this time the corrupt Santa Anna rose to power. A dishonest and ruthless politician, thief, compulsive gambler, opium addict and liar, he nevertheless gained a measure of popular support and set about destroying federalism. Conflict with the American settlers ('Texians') became inevitable, a conflict which included the legendary Battle of the Alamo. 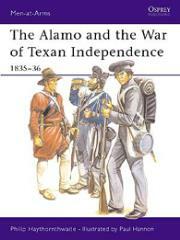 Philip Haythornwaite covers the story of the War of Texan Independence in a volume backed by a wealth of illustrations and photographs, including eight full page color plates by Paul Hannon.